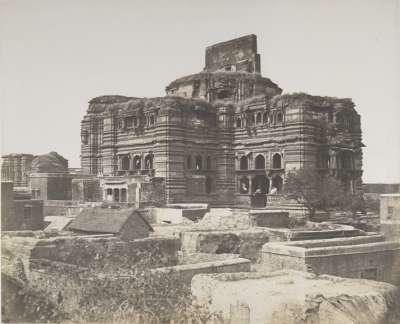 Photograph of the Govindadeva temple at Vrindavan, from the Murray Collection: 'Photographic views in Agra and its vicinity', taken by John Murray in the mid-1850s. Vrindavan is a pilgrimage town on the bank of the Yamuna river. The temple was built in 1590, only the mandapa, or large porch remains as the towered sanctuary was destroyed under the orders of Aurangzeb. The mandapa is built on a stepped plan and has projecting porches and balconies on two storeys. Influence from the style of contemporary mosque architecture can be seen in the use of arches, pointed vaults and a dome internally. The walls have deeply carved mouldings with no figural sculpture.